Theatre students refine their communication skills and gain a deeper understanding of history and practice theatre as an art form. All students have an opportunity to develop to their highest potential despite differences in learning rates and prior knowledge and skills. 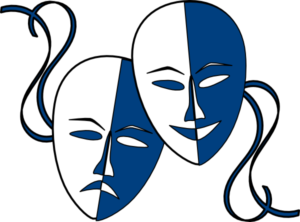 Perception – Creative drama is the focus for middle-school students. Students will incorporate their life experiences into dramatic play by creating environments, analyzing characters, and inventing action to depict various life experiences. Historical and Cultural Heritage – In addition to personal experiences, students draw from various cultures, literature, and history to create drama and improvisations and assume roles within dramatizations. There will be an emphasis on the “self” throughout the year. Performance – Students will work collaboratively to plan a dramatization, take part in its production, and discuss and evaluate the results. They will use sets, visual elements, costumes, and props. They will practice projecting movement and improvising dialogues. They will also be learning how to perform monologues.